In a Twitter aside during his election campaign, Donald Trump dismissed the UN as “just a club for people to get together, talk and have a good time”. 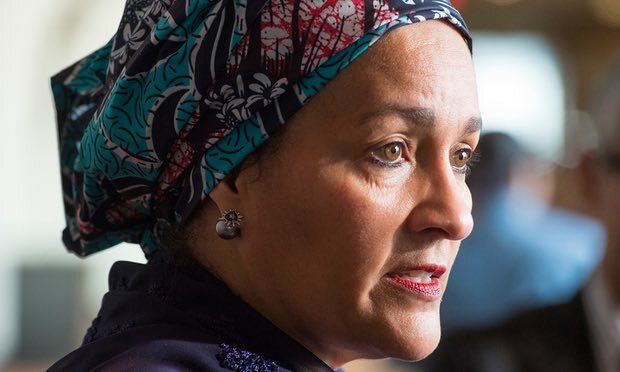 For Amina Mohammed, the organisation’s new deputy secretary general, it is anything but. Attempting to meet some of the world’s most intractable crises and developmental challenges head on is what drives the focused Mohammed, for whom battling against the odds has been a lifelong theme. The former Nigerian environment minister once confided that she had to raise money when she wanted to study hotel catering management in Italy. The journey has indeed been long, all the way from a primary school by Lake Chad to a place at the side of UN chief António Guterres, torchbearer of a sprawling organisation that, for all its very publicly displayed weaknesses, is of such vital importance to the global south. Even Mohammed’s CV is a marathon. She is the eldest of five daughters and now a mother of six children. Her father, a Nigerian herdsman and a vet, met her mother, a nurse, while studying in Britain. After Mohammed finished her studies in Italy, her father demanded she return to Nigeria, and to a job – he promised – at the American consulate in Kaduna. When she arrived, though, it quickly became apparent there was no job. After years in the private sector, Mohammed served three Nigerian presidents before becoming adviser to Ban Ki-moon, Guterres’ predecessor as secretary general, on the post-2015 development agenda. Now back at UN headquarters after a brief stint as environment minister in Nigeria, her development and environment brief is as sharp and specific as the 17 sustainable development goals she helped to hone down from the 500 or so originally proposed by member states. With global cooperation and solidarity key to achieving the goals by 2030, the Trump administration’s very public disdain for climate issues has obvious implications for the Paris climate change agreement. Mohammed stresses the importance of shared responsibility, of trying to pick up any countries that might stumble en route to seeing the process through. Mohammed knows whereof she speaks. After Paris, she visited Lake Chad to witness the effects of climate change at first-hand. Her childhood stamping ground had changed beyond recognition. Mohammed is determined there will be no comparable lack of governance at the UN. As the organisation braces itself for a whirlwind of proposed cuts under the Trump administration, the new leadership in Turtle Bay is committed to ensuring the UN remains capable of delivering on its development, peacekeeping and many other commitments.